You arrive in Roseau, the capital of Dominica, and are immediately struck by the picturesque charm of timber homes and botanical gardens. Although the island of Dominica is actually one of the largest islands in the Caribbean, the population is a mere 72,000 and its beauty remains both natural and unspoiled. 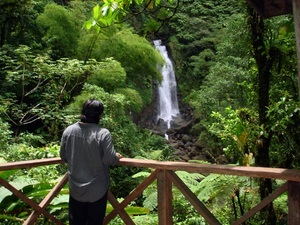 However, there is still much to do and we have the Rosean Excursion that will help make your stay memorable, check out our Dominica Natural Highlights Eco Excursion which will show you the best of Roseau. When a country's flag proudly displays a parrot, you just know you've arrived someplace that is unique. Still unspoiled by commercialism, the weather is tropical, the food is delicious, and the beauty is breathtaking. Check out the 18th century Creole architecture, lie back in geothermal springs, or maybe you want to visit the Morne Trois Pitons National Park, which is a dedicated UNESCO World Heritage Site. Other Roseau Cruise Excursion attractions such as our Dominica Champagne Reef Shore Snorkel Excursion or our Dominica Champagne Reef Snorkel and Hot Springs Excursion; both include snorkeling by Champagne Reef, which naturally mimics a bubbly glass of champagne served by Mother Nature, herself. You'll find options for divers as well, check out our Dominica Champagne Reef 1 Tank SCUBA Diving Excursion. Check out Boiling Lake, the abundance of tropical birds, or just kick back and enjoy the pod of Sperm Whales that live just off the island year round. For movie buffs, the island may look familiar since it was the film setting for Pirates of the Caribbean Dead Man's Chest. This tells all photo buffs that they have arrived in one of the best scenic locations anywhere. Adventurers may want to take a hike, go on a zip-line circuit, or go rock climbing by fabulous waterfalls. Then, for those who love adventure, but crave relaxation as well, we'd suggest a lazy river tubing excursion where you will float past the lush rainforest filled with tropical birds. No matter your preference, we'll have the Rosean Excursion that is perfect for you. Welcome to paradise, enjoy! Fun Fact: Dominica was actually named for the day it was discovered by Columbus, which was a Sunday. Round trip transportation from your Dominica cruise ship terminal! Instructions and supervision by professional local guides! Guests will visit: Champagne Reef, Botanical Gardens, Titou Gorge, Trafalgar Falls and overlook from Morne Bruce! This adventure has it all...Champagne Reef, scenic overlooks, Titou Gorge and the wondrous twin falls and more! 1 hrs of supervised snorkel at the gorgeous Champagne Reef! Complimentary drink after your water activity! National Park and Marine Reserve fees! Dip in the volcanic hot springs at Soufriere Sulphur Springs! Champagne and Volcano Spa? Well almost! Enjoy a great guided snorkel excursion at the bubbly Champagne Reef right from the shore and relax in the hot springs at Soufriere Sulphur Springs! Round trip transportation from your Roseau Dominica cruise ship terminal to the snorkel base! 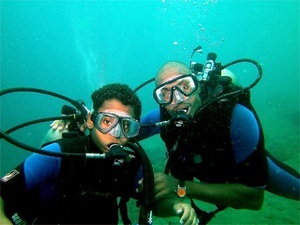 English speaking, PADI certified SCUBA dive master/guide! 2 tank guided diving excursion at Champagne Reef and a West Indian cargo ship wreck! SCUBA gear - shorties, tanks, weight belt, weights, BCD, mask, regulator, and fins! Flexible return time to your Dominica cruise ship pier! Enjoy a two-tank scuba dive shore excursion on the amazing Dominica Champagne Reef and a West Indian cargo shipwreck too. Be surrounded by geothermal bubbles and Caribbean marine life! Round trip transportation from your Dominica cruise ship terminal to snorkel center! 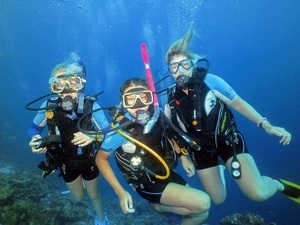 English speaking Dominica snorkel excursion guides! 1 hr of supervised snorkel tour over the gorgeous Champagne Reef right from the shore - no boat needed! Access to water sport center facilities with showers, changing rooms, gift shop and sundeck! Flexible return time to your Roseau Dominica cruise pier! Like snorkelling in a huge glass of Caribbean Sea Champagne...this unique and guided Dominica snorkel excursion will take you to the amazing Champagne Reef! English speaking PADI certified dive instructor! 1 tank dive at Champagne Reef directly from the shore! SCUBA gear - one tank, weight belt/weights, BCD, regulator, mask and fins along with shortie wet suit! 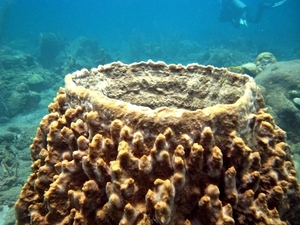 Discover Champagne Reef, Dominica's top diving site on this one tank dive from shore. Enjoy diving through the champagne like bubbles! English speaking, PADI certified dive instructor! 1 tank dive at Champagne Reef! SCUBA gear - Tank, weight belt, weights, BCD, mask and fins along with shortie wet suit! Enjoy the chance to venture beyond snorkeling and experience a real scuba dive at Champagne Reef, one of the most beautiful reefs in the Caribbean. For first time, beginners only! 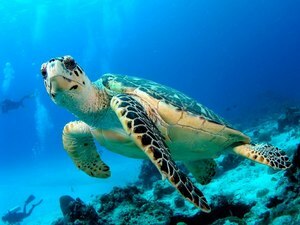 Discover SCUBA diving.